The NAAIM Founders Award is a research competition that draws entries from all over the world in the areas of computational finance, advanced algorithms, tactical investment management techniques, strategic investment strategies and numerous other topics, all designed to further our knowledge of the active investing world. Papers need to focus on describing an investment technique, its pros and cons and the market conditions under which it is expected to fare well or poorly, or should explore topics in active investing that are of broad interest to the investment community. Uncommon Knowledge 2019 registration, domestic coach airfare and one night lodging for one author of the winning paper. Paper Topics: The papers should cover an innovative topic in the area of active investing. This can be either a documented investing approach, an exploration into the validity of active investing, or research in the other issues related to active investing such as making investment decisions using technical analysis, quantitative analysis, etc. Papers can also address related topics such as position sizing techniques, money management approaches, scaling into and out of trades, exit strategies, tax harvesting, execution, etc. Launched in 2009, the NAAIM Founders Award (formerly known as the NAAIM Wagner Award) is designed to expand awareness of active investment management techniques and the results of active strategies through the solicitation and publication of research on active management. $5,000 is presented annually for the best paper submitted to the competition. The 2007-2008 bear market, following on the heels of the 2000-2002 decline, led many investors to question the wisdom of buy-and-hold investing. NAAIM members have always believed active is better. This competition is designed to support this position through sound research and shine the spotlight on those individuals advancing this field of study. Since 2009 the call for papers resulted in an international response, with authors from New Zealand, Great Britain, Canada, Germany, and India as well as the U.S., submitting research demonstrating advancements in active investment management and it’s potential. The competition is open to all investment practitioners, academic faculty and doctoral candidates who submit an innovative topic in the area of active investing. This can be either a documented and justified investing ap­proach or an exploration into the validity of active investing. Active investing topics can involve making invest­ment decisions using technical analysis, quantitative analysis, etc. Papers can also address related topics such as position sizing techniques, money management approaches, scaling into and out of trades, exit strategies, etc. Littleton, CO – May 9, 2018 – Professors Shuoyuan He and Gans Narayanamoorthy of Tulane University in New Orleans, LA, have been named the 2018 first place winners of the National Association of Active Investment Managers (NAAIM) Founders Award for Advances in Active Management. Professors He and Narayanamoorthy received $5,000 and presented their paper – Earnings Acceleration and Stock Returns – at the NAAIM Uncommon Knowledge Conference in Orlando, FL. Academic research tends to lean towards the belief that markets are efficient and price contains all the known information about a stock. Professors He and Narayanamoorthy set out in their paper to test what drives inefficiencies in the financial markets that leaves “money on the table” and opportunities for trading strategies to produce above market returns. Their paper determines that earnings acceleration, defined as the quarter-over-quarter change in seasonal earnings growth, has significant explanatory power for future excess returns. These excess returns are robust to a wide range of previously documented anomalies as well as a battery of risk controls. While earnings momentum can potentially capture price trend one quarter ahead, earnings acceleration has positive implications for second and third quarter pricing. Different patterns of earnings acceleration provide opportunities for long-short hedge trades that create return in excess of the market over the period of the study. Dr. He and Dr. Narayanamoorthy’s paper, Earnings Acceleration and Stock Returns, is available on the NAAIM website at www.naaim.org, along with winning papers from prior competitions. 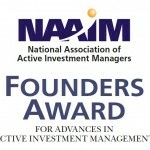 The NAAIM Founders Award was launched in 2009 to expand awareness of active investment management techniques and the results of active strategies through the solicitation and publication of research on active management. Over the last nine years, the program has attracted more than 140 papers in support of active investment management submitted by financial professionals and academia from the U.S., Canada, Europe and Australia. A panel of investment professionals selected by the Founders Award committee reviews entries and awards the prizes. Criteria used in judging the papers are: practical significance to practitioners of active investing; quality of exposition; analytical rigor; and novelty of results. Dr. Shuoyuan He is a Visiting Assistant Professor of Accounting in the A.B. Freeman School of Business at Tulane University. Her research interests focus on capital markets research in accounting, with primary emphasis on earnings forecast and market efficiency. She received her Ph.D. in accountancy from the University of Illinois at Urbana-Champaign, where she subsequently held a faculty appointment. Before entering academia, she worked as an auditor for Ernst & Young. Dr. Gans Narayanamoorthy is an Associate Professor of Accounting in the A.B. Freeman School of Business at Tulane University. His research has been published extensively in top accounting journals and focuses on capital markets in accounting, with particular emphasis on market efficiency, litigation risk and bank accounting. He teaches Advanced Financial Accounting and Accounting for Business and Financial Risk at Tulane. Prior to Tulane, he held faculty positions at Yale and the University of Illinois at Urbana-Champaign. Before entering academia, he worked as an investment banker, managing public offerings of large corporations, including Fortune 500 companies.